I got a quick sentimental education this morning from The Very Short List—its headline an homage to Flaubert, in the spirit of the post. It took me to a French website offering a queue of still shots from The Simpsons, alongside the famous paintings that inspired them. It’s a good way to spend a few minutes for the five or six people out there who still might not recognize how much intelligence, wit and imagination goes into that venerable television series. It’s all in French, but the images tell the whole story. The Simpsons is one of popular entertainments most enjoyable ongoing acts of creative theft. It borrows, steals and sends up nearly as much content from other sources as The Wasteland or Girl Talk. The creators of that wonderful cartoon have always layered into the story lines a variety of cultural references that can pass by so quickly, they’re essentially throwaway jokes. 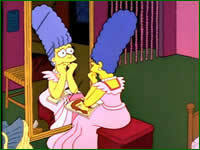 The image of Marge sitting at her vanity tending her beehive might have slipped past unrecognized as a parody of Normal Rockwell’s Girl at the Mirror, but most are unmistakable: Michelangelo’s Creation of Adam in the Springfield post office, Homer’s portrait as a version of Van Gogh in his pale blue suit coat, and the Mondrian hanging on the wall of the Simpson living room. Mmmm, painting! The colors in all of my photographs originate from my subjects. Numbers and rust often derive from train cars; letters and words come from signs and graffiti, torn paper and pieces of posters are from exterior poster walls. After developing the images from raw digital files, I alter a specific image to black-and- white, and then begins a process of cut and paste that I have developed, using multiple images of close-ups of paint, followed by photographs of signs. Numerous other photos are added and overlapped. Although I have used as few as 10 images to create simple images, often 50 or more photographs are used in this process. Though his imagery sometimes seems to veer closer to graphic design than fine art, his work evokes rich color harmonies that emerge calmly toward the viewer though all the intentional discord of the surface. He and Talcott work almost entirely in Brooklyn. They met 18 years ago, started painting together 5 years ago, sharing influences and competing in a friendly way, and were married less than two years ago. 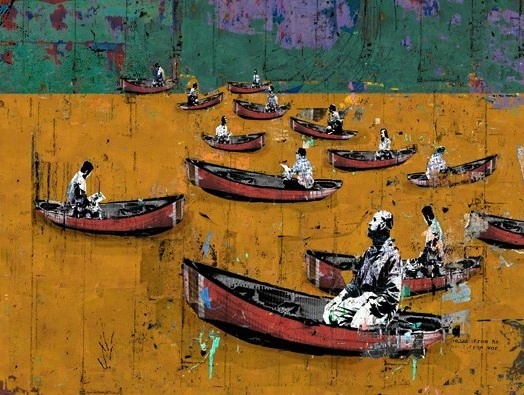 Their work is heavily gestural, from life, and they both paint urban scenes. 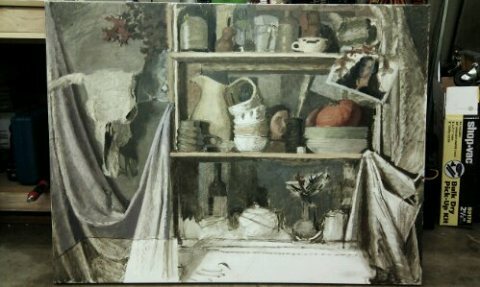 Though I liked most of what I saw in the show, Talcott’s still lifes, some of them fairly large, stood out: both daring in their execution and accomplished in their handling of color, which has gotten more intense and varied in the most recent work. One of my favorites was one of the older paintings, a large still life of a melon and a jar, loosely rendered in subtle tones with a limited and cool palette. 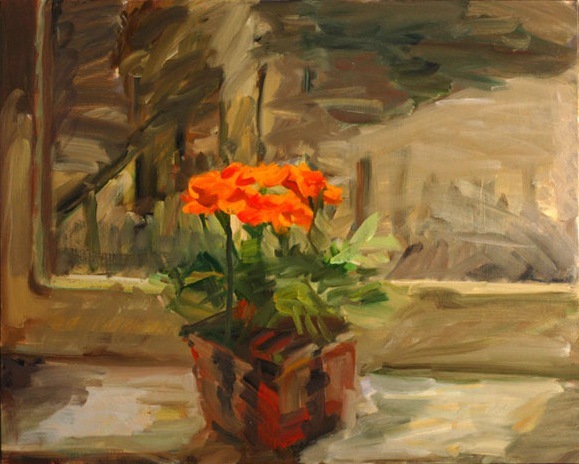 Another shows a pot of marigolds sitting on a windowsill with what appears to be a cityscape in the distance, possibly one of the bridges connecting Brooklyn to Manhattan. I come away from many shows with an ability to clearly visualize only a few works, but many of Talcott’s compositions remain vivid memories for me, offering a creative tension between spontaneous handling of paint and masterful color choice and composition. Her best work is stylistically indebted to masterful colorists: Matisse, Matthiasdottir, and Freilicher. It’s a show off the usual gallery beat, in a space many small galleries would envy. It’ll go back to see again if I get back to the city before it closes. So said Solomon, and Sarah F. Burns appears to agree. You can drop in and see a painting by her in progress on her blog. I believe it’s a part of a series of vanitas images she’s doing on commission, not the sort of job one gets hired to do every day. You can read about it on her blog: Sarah F. Burns. She’s also offering a great photograph of a young Francis Bacon holding up two carcasses: Bacon bringing home the bacon, maybe. I’ve gotten behind with these posts, being involved in a writing project this month, and not painting much at all, but I took the time to do a little email with Sarah on the subject of skulls. I’d considered a collaboration with someone on some work based on skull imagery, and it struck me that if I were to do a painting of a skull from life, it would be cheating to use a plastic model, though I couldn’t find any source of actual human skulls on the web. It turns out there are at least one or two, The Bone Room, for example, and the skulls come from China and India, but laws prohibiting their sale have been enacted there so if you’re going to buy one, you’re choosing from the limited and dwindling inventory. So, as it turned out, I found myself debating whether to own the skull of someone who once had a name and had walked around on the planet for a while. It seemed somehow wrong to just buy what remained of this poor fellow’s head, though I don’t know why. He certainly doesn’t need it. It’s costly, too. Looked to me as if $800 was the lowest I could pay. I visualized a box arriving in the mail and slowly opening it to lift the gray dome of bone and hold it in my hand. Why am I still tempted to do this and still feel I’m contemplating something almost immoral, or at least disrespectful. As Sarah put it, it’s “creepy but cool.” Like a vanitas image itself: the whole skull search brought to mind the transience of life, and how little time there really is to get done whatever it is I hope to do, both in this coming year and the following ones. Painting constantly forces you back in touch with your limits on so many fronts: money, skill, physical space in which to work, imagination, and most of all, time. You are currently browsing the represent weblog archives for the month January, 2012.